Shown in profile turned toward the right. Divided into two vertical panels. The right one had above a window with a curtain. 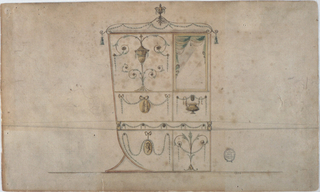 The panel beside it is decorated with a candelabrum. The central panel is decorated with a medallion and festoons at left. A bowl and festoons at right. The lowest panels are decorated with a medallion portrait and festoons at left with a plant at right. On top of the roof is a vase with a mark. Tassels hand at the corners. The bar is decorated in the width of the chair.